Considering so many divisive and controversial figures have in the past received a state funeral, why deny Margaret Thatcher one? 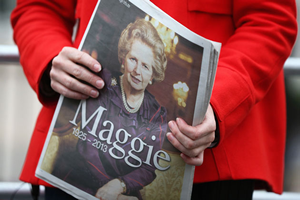 The growing disquiet over the cost of Margaret Thatcher’s state-funeral-in-all-but-name gathers pace, with the £10 million bill borne by the taxpayer not reckoned to include police overtime and the ‘contribution’ of the Thatcher family not revealed. Of course, officially sanctioned state funerals are rare events (apparently requiring a vote in Parliament, the involvement of the navy in the funeral procession and for the body to have been laid-in-waiting). Over the past 114 years there have only been five non-royal state funerals and these are book-ended by William Gladstone’s in 1898 and Sir Winston Churchill’s in 1965. By most people’s estimations, Churchill deserved a state funeral. He may have been a mercurial figure and a lousy chancellor, but his account is more than levelled by his leadership during the Second World War. Similarly Gladstone, still our longest-serving Prime Minister and a great reformer, was equally worthy of the accolade. As Sir Edward Carson he became the first signatory of the Ulster Covenant in 1912 which notoriously pledged its signatories to oppose moves towards Irish Home Rule by ‘all means necessary’. To back-up his blood-curdling rhetoric, Carson founded the loyalist paramilitary group, the Ulster Volunteers, taking a smuggled shipment of 20,000 rifles and three million rounds of ammunition from Germany. Carson is credited with helping create Northern Ireland (although he himself didn’t want to see partition and refused the opportunity to be its first prime minister). A formidable barrister, Carson defended the Marquis of Queensbury in the libel action brought by Oscar Wilde following Queensbury’s accusation of homosexuality. Wilde’s resolve was said to have broken when it was clear Carson, a notably ruthless man, was willing to bring forward male prostitutes to testify against him. The subsequent legal costs awarded against Wilde ruined him and he was convicted and sentenced to two years’ hard labour. Douglas Haig was commander of the British Expeditionary Force during the First World War, rising to the rank of Field Marshall in 1917. Notoriously, Haig was in charge during the Battle of the Somme – one of the bloodiest in warfare – with around 1.2 million casualties. He forever earned the nickname of ‘Butcher Haig’ due to his inept, outmoded military tactics which cost so many lives. At the Battle of Loos, Haig gave permission to used chlorine gas against the German lines, however the gas lingered on the battlefield and ended up injuring more than 2,000 British soldiers (causing seven deaths) because of the poor quality of their gas masks. Haig’s reputation suffered badly in the decades after the First World War, with no less a figure than Churchill criticising him for blocking enemy machine gun fire with ‘the breasts of brave men’. Memorably former Conservative defence minister Alan Clark wrote a seminal 1961 book on First World War Generals called ‘The Donkeys’ (popularising the phrase ‘lions led by donkeys’). Rash, pig-headed and wasteful, is it surprising that at Oxford, Haig he was a member of the Bullingdon Club? Known as ‘Kipling’s General’ (he wrote three gushing poems about him) Frederick Roberts’ military career reads like a checklist of 19th century British imperial might. The archetypal Victorian romantic soldier-general, Roberts first gained notice during the Indian Mutiny of 1857 (or India’s First War of Independence, depending on your perspective). He later rose to become commander-in-chief of the army in India, before rising to the rank of Field Marshall. He also led notable expeditions to Abyssinia and Afghanistan and commanded British forces during the Second Boer War. However on retirement he became a keen proponent of conscription in the run-up to the First World War, (although, commendably, he disagreed with Haig about his old-fashioned attachment to the importance of training cavalry to charge with lance). Some accounts argue that he also played a part in egging-on officers involved in the so-called Curragh Mutiny of 1913 when 60 British officers made it clear they would refuse orders if there was any move to enforce Irish Home Rule against Carson’s Ulster Volunteers. Rumours of atrocities in Afghanistan were also made against Roberts. So in the company of such divisive and controversial figures, how could we have denied Margaret Thatcher a similar state funeral? Growing disquiet? – its just a few of the usual suspects mouthing off for their few minutes of fame. I watched as procession went through Ludgate Hill and the overwhelming support and appreciation in the huge crowd for this Lady was incredible. Perhaps now she has finally gone the Left can move on and stop treating her as some pantomime villain. Most of those whinging about the cost aer all too happy to fritter taxes away on the likes of Phillpot and Quatada – despite paying a tiny proportion of the income tax raised. Gladstone isn’t our longest serving Prime Minister, Walpole and Pitt the Younger both served for considerably longer periods. Correction: Most of the left chose to boycott this farce of a funeral. Not since the GRA – which is the logical place to start measuring these things.